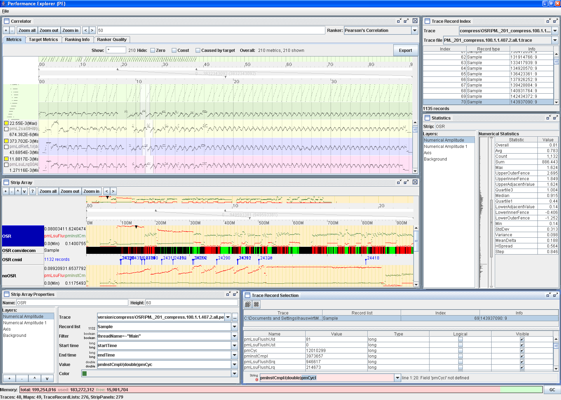 Performance Explorer is an interactive tool for the offline visualization and analysis of traces of system performance. We originally developed Performance Explorer (PE) as a tool to analyze the behavior of the Jikes Research Virtual Machine (Jikes RVM). We later turned into an Eclipse plug-in. PE was subsequently used for visualizing traces of IBM's Continuous Program Optimization (CPO) research team in their Performance and Environment Monitoring (PEM) infrastructure, and it was used to study the performance of multi-core systems based on traces instead of aggregate performance metrics. PE uses a flexible binary trace file format and provides a computational engine implementing a Java-like expression language. A user can interactively build visualizations consisting of different basic building blocks. Each visualization can combine information from any number of traces.